This small cheese was originally made in the Rhone Alpes region of France. It has a very thin rind so is usually kept in a small crock. As it ages, it develops a gooey texture. When it is warmed a little, Oh My, it is a runny delight! Saint Marcellin is a little different to make from other soft ripened cheeses like Brie or Camembert. This cheese is meant to be soft and moist. 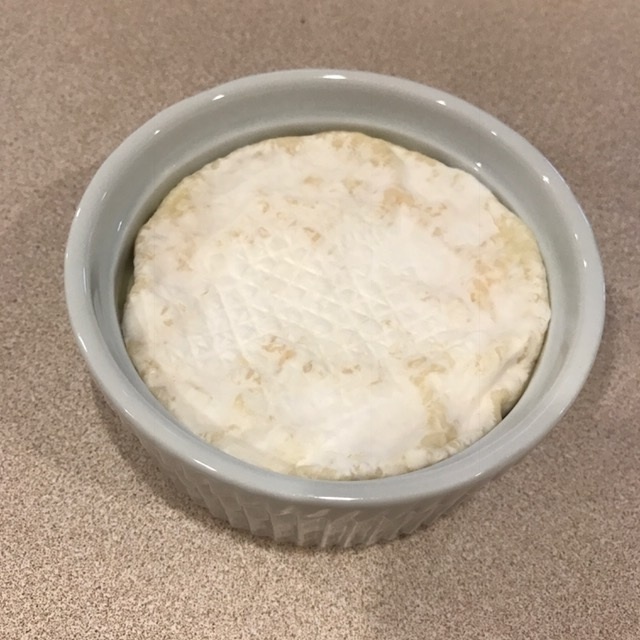 It has a beige rind and a creamy interior. We use much less rennet than in other recipes so the ripening time is much longer. This cheese needs to ripen in a warm place (72-75°F) for 18 hours. This can be challenging during the winter, but a small light in a small space is usually enough to maintain this temperature. The goal is to keep the curds very moist. 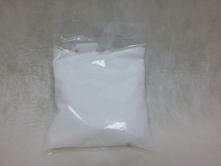 Therefore, the curds are cut into quite large pieces (1") and definitely not stirred. After cutting, a rubber spatula is used to just go around the edge before the curds are allowed to rest. 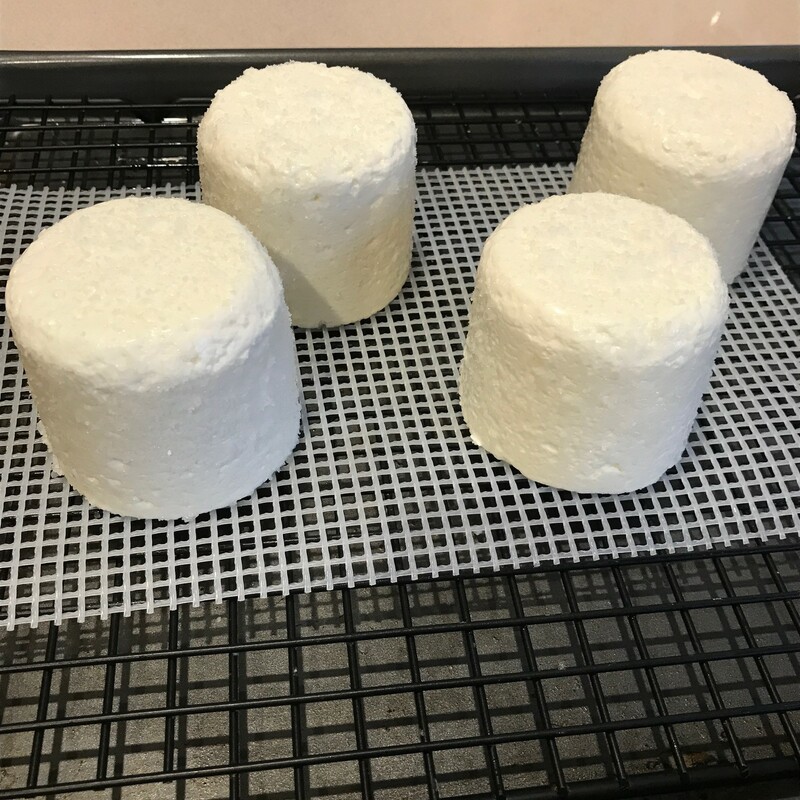 The curds will be very soft so treat them gently while ladling into the molds . It will take a while for enough whey to drain off in order to get all the curds into the 4 molds. This is normal so don't consider adding another mold! After 6 hours of draining, the cheeses need to be turned over. 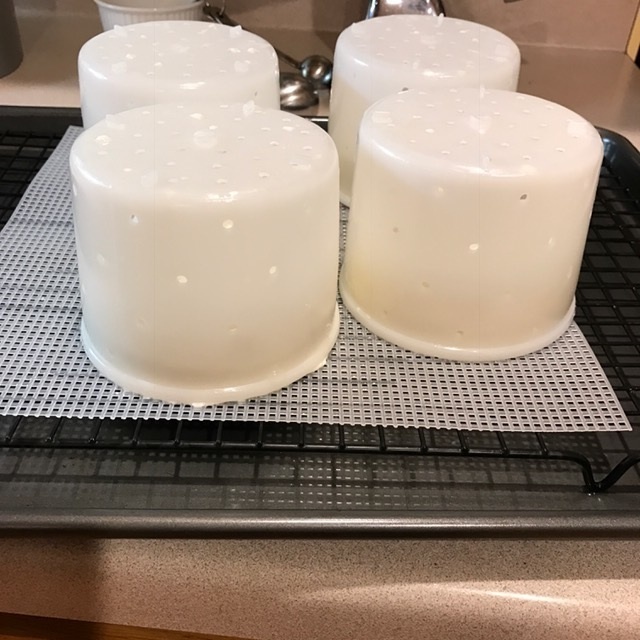 They are still really soft so it is best to gently turn them over, IN THE MOLDS. Leave the mold on and gently tap the top to get the cheese to fall down to the mat. Then carefully lift off the mold, salt the cheese, and put the mold back on. This way, the shape of the cheese will be maintained. If it is still very soft at the next turning time, don't worry. Just leave the mold on again. When the draining has been finished, the cheeses will be put in a ripening pan in a cheese "cave" or other 55°F. area to be turned daily. 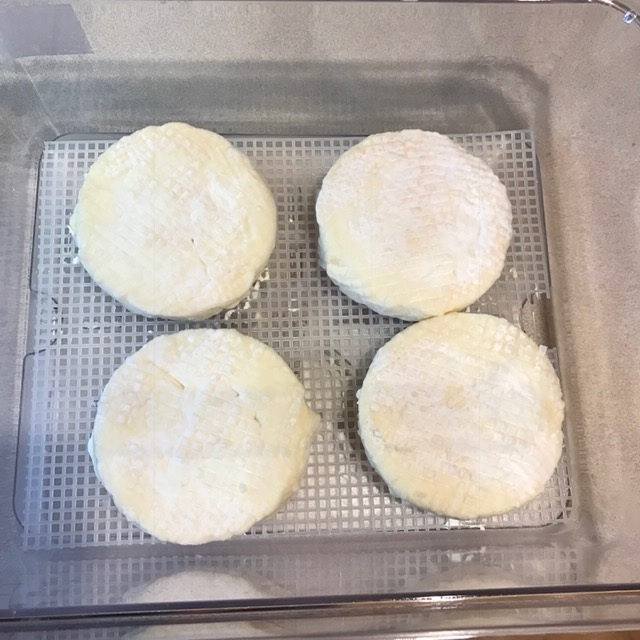 Within 14 days the white fuzzy mold should develop. At this point the cheeses are ready to eat! However, if they are put in ceramic crocks, covered with plastic wrap and put in the refrigerator for a couple of weeks, they will be fabulous! The right size crock is readily available at most kitchenware stores. Saint Marcellin is a special cheese that you will want to make again and again!